Color Marketing Group's celebration of violet erupts for 2018! In celebration of the predictions, Color Marketing Group® congratulates, and concurs with Pantone, on their exciting choice for their color of the year, Ultra Violet. 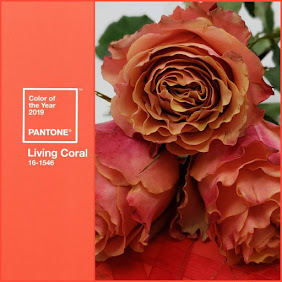 We are ecstatic with their choice and our shared enthusiasm for color. Violet hues appeared in forecasts from CMG's Asia Pacific's "Pudding Purple," to North America's "Bruised Steel," as colors of importance for the year. An incredible amount of amazing has been going on at the Details Flowers office this month of December. 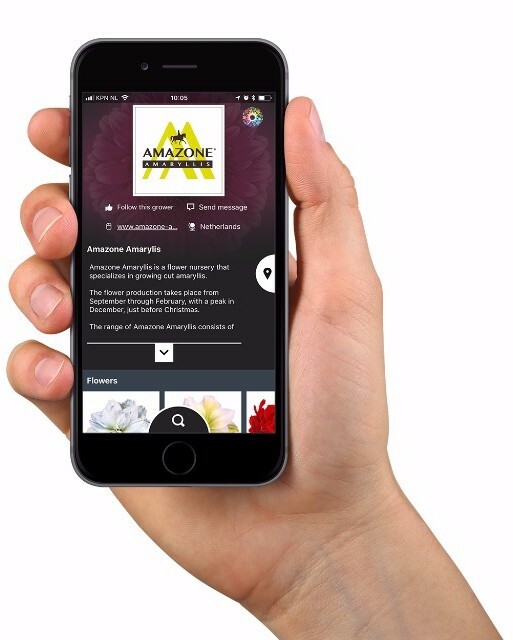 From an extraordinary partnership with The Society of American Florists, to the anticipated release of brand new features and updates (we can't wait!) our excitement can hardly be contained! Our December Newsletter is your tell-all for every "Blooming Detail!" Want to have access to everything Details Flowers? Join our Facebook community to get all the latest news about features, updates, contests, and more! SAF members, do we have great news for you! 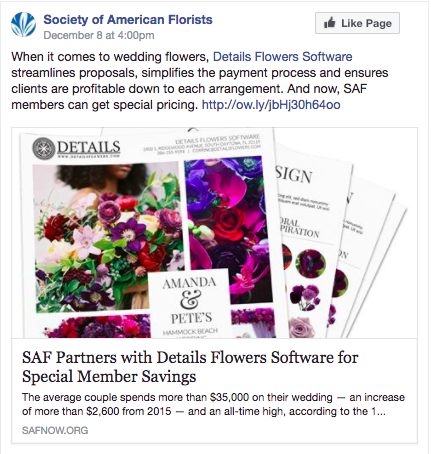 Details Flowers Software is proud to partnership with SAF! They have been an advocate for the growth of retail florists, flower growers, floral wholesalers and suppliers, importers, event-only florists, floral educators and students alike since 1884. 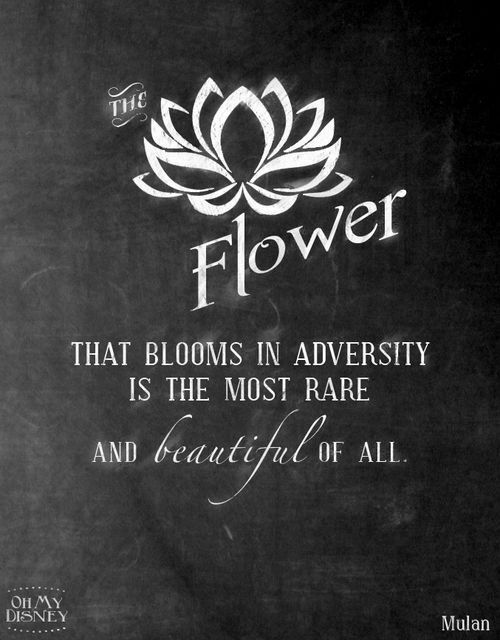 Just like SAF, we want to help your business bloom and grow! For new customers that are current SAF customers, you can receive a Free 14-Day trial & special membership price for Details Flowers Software. 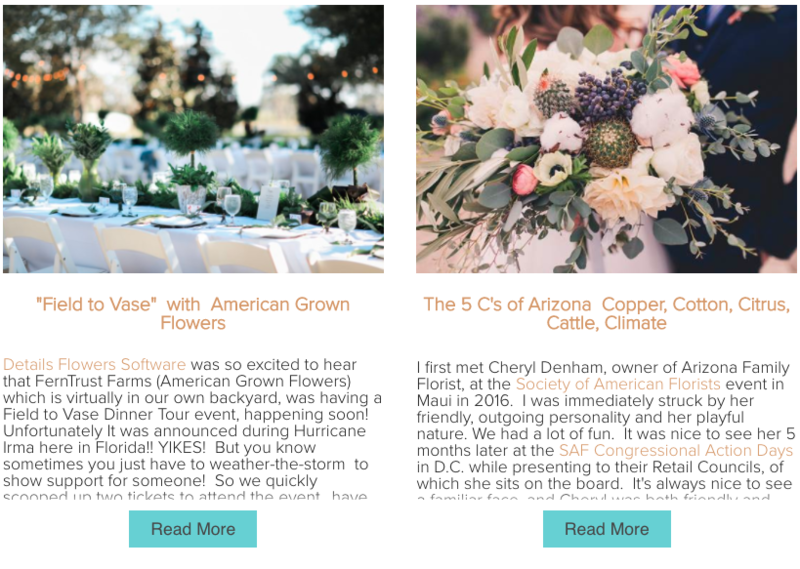 Read their latest article to learn more & how you can sign up for Details Flowers Software! 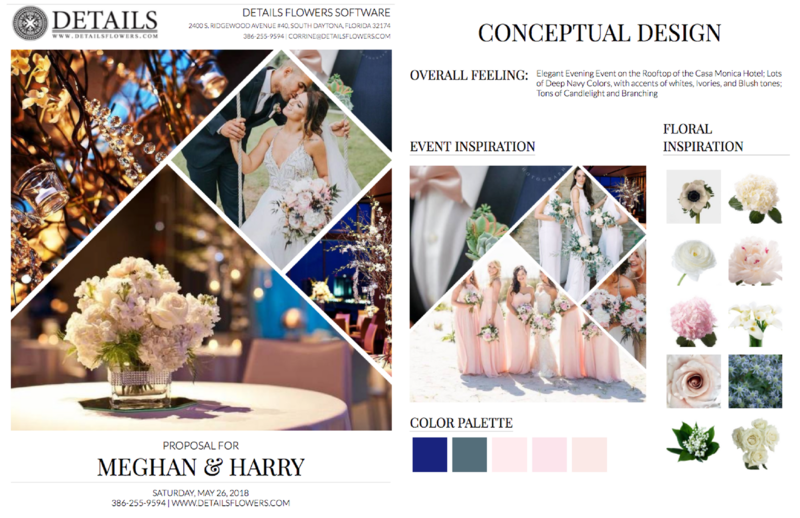 Thank you to The Garden of Eden Flower Shop & Sweet Stems Florist for sharing your images to make the Thrive Template. Another thanks to Haute Floral & our own Corrine Heck for helping us create the Grow Template! Have you ever dreamed about dining on an artisanal meal surrounded by hundreds of lush ferns? One of our very loved florists, Sally Kobylinski from In Bloom Florist was lucky enough to experience this incredible event first-hand! 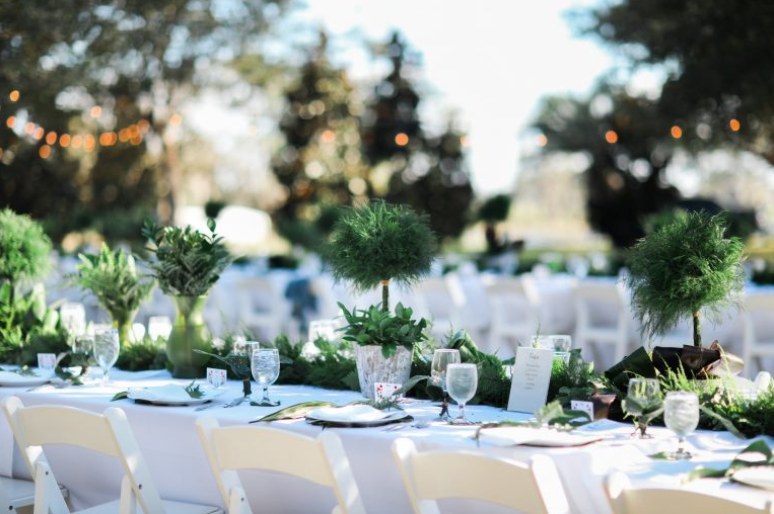 Read about her participation at this year's American Grown Field to Vase Dinner in Seville, Florida at FernTrust Incorporated. If you have been wanting to attend a floral workshop in 2018, but was not sure where to find the best...look no further! We've done the research for you to bring you the "what's what" in 2018. Visit our Education Page to learn more about some incredible 2018 floral and event workshops. 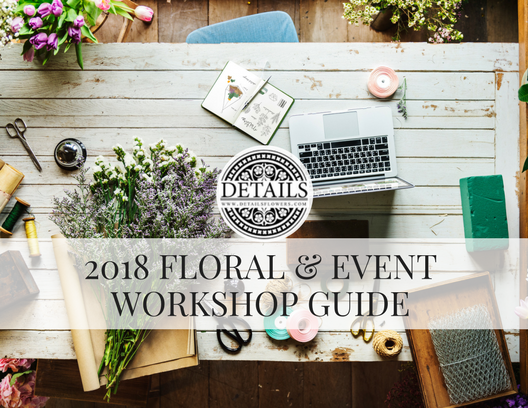 Are you hosting your own floral or event workshop in 2018? Fill out our questionnaire and let us know if you would like Details Flowers to promote your workshop. We would love to partner with you! Calling all current customers!! 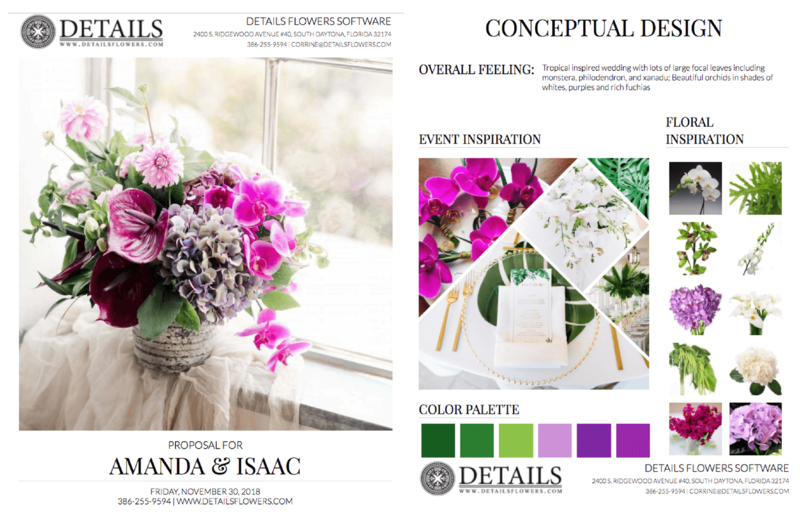 Have you applied to be a Details Flowers Brand Ambassador yet? If you are interested in earning perks, like Details Dollars, to use toward your subscription let us know and we will send you the application! 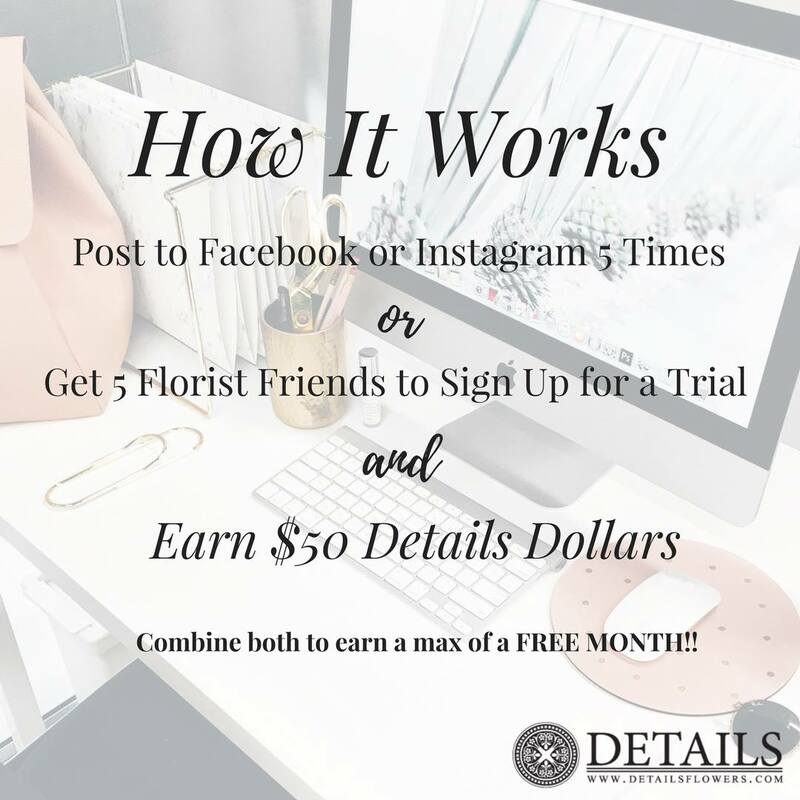 It is as simple as posting to Facebook or Instagram, or having your fabulous florist friends signing up for a free-trial with Details Flowers Software. If you're hosting a workshop, what could be better than having your own special code for sign up? 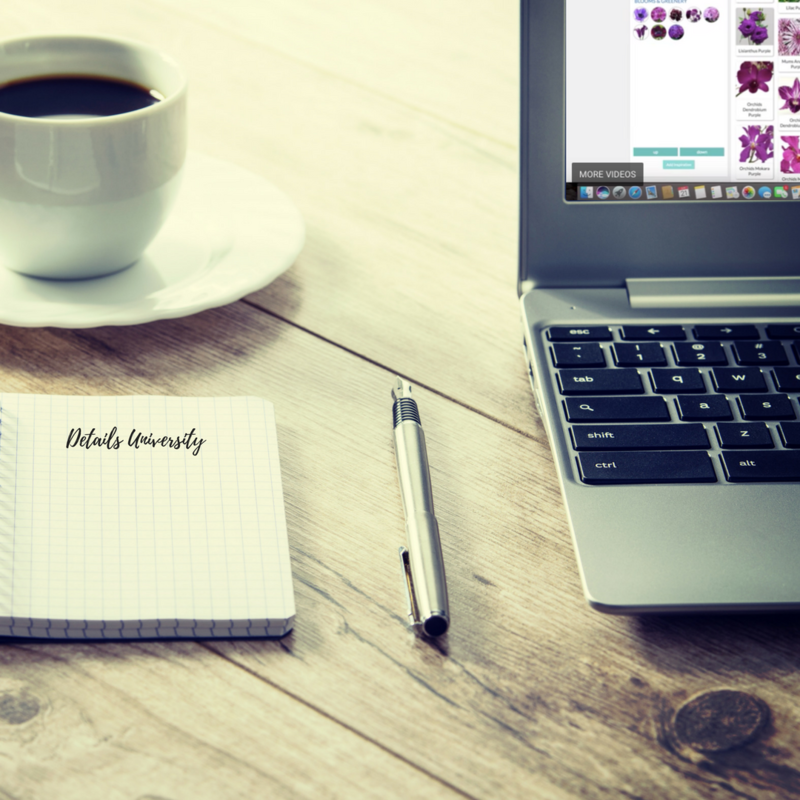 Your place to learn about new features, updates, and all things fun & floral! Current customers, want to be featured, just like Cheryl Denham from Arizona Family Florist? Let us know in our Facebook group! Have you attended Details University yet? If you are just getting started, or have been with us since the beginning, Details University is here to help you! D.U. consists of four (4) free courses for our customers that cover specific areas of the software. The best part is you can schedule them in any order on your own time! Don't worry, this isn't a traditional class--each course is one-on-one with a member of the Details Flowers team. Get inspired! Have a look at our new floral winter trend "Romance 3.0"
The winter edition of the Bouquet Tales paper "A TOUCH OF LUXURY" is available! Copyright © 2017 Bloomtube, All rights reserved. 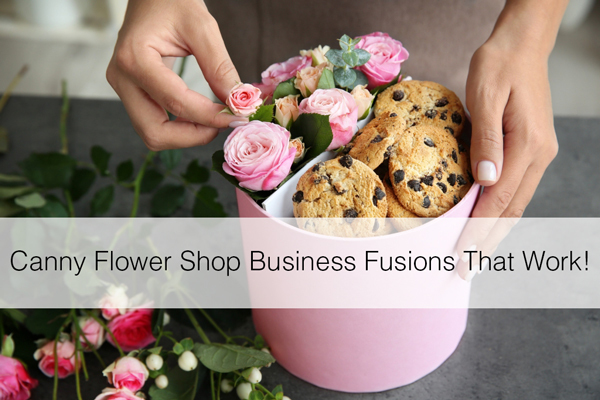 Combining a flower shop with another kind of business can raise sales as both work to give exposure to the other. More and more flower business owners are tackling more than just flowers. Click Here to Learn More Popular Combinations! Amaryllis season in full effect! Yes, we are getting ready again for the Christmas days! In our last mail we informed you about two bouvardia varieties that are great for Christmas arrangements. But what about this famous Christmas product, the Amaryllis! To see how the grower is preparing himself for the coming hectic days we went to visit Amazone Amaryllis. During the visit we had a glimpse of the process and the beautiful varieties that they grow. Field full of fresh grown amaryllis, these will be ready to cut within a few days. The growing is completely planned and structured for the upcoming holidays. 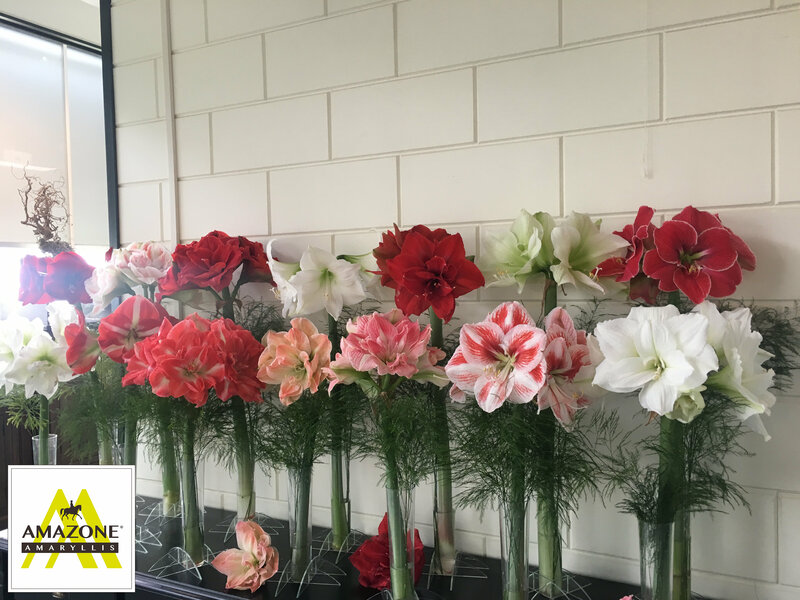 By controlling the bulb- and greenhouse temperature this grower can spread the bloom and make sure that we can enjoy these beautiful flowers in winter and specially for Christmas. These amaryllis are cut and ready for transport to go to the auction or to the wholesale. They are packed carefully with protection around the flowers. 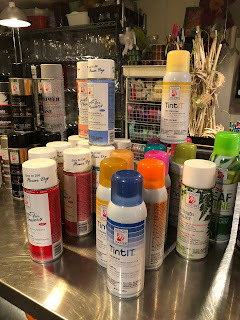 Availability, Where and when to buy? Check out the availability in the Flowerbook app or contact your local supplier for the buying options! 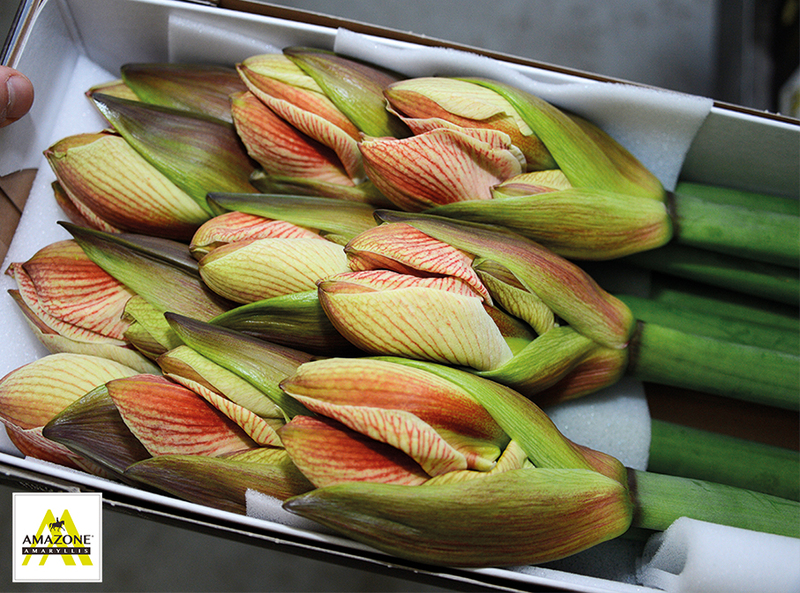 The season of Amazone Amaryllis starts in October and is ends generally in January. Of each variety that are grown by Amazone they show off one flower. The above images are on the left Nymph and on the right Sunny Nymph. These flowers are left on the field to show visitors the products! As a florist, you are always looking for the most beautiful flowers to work with. 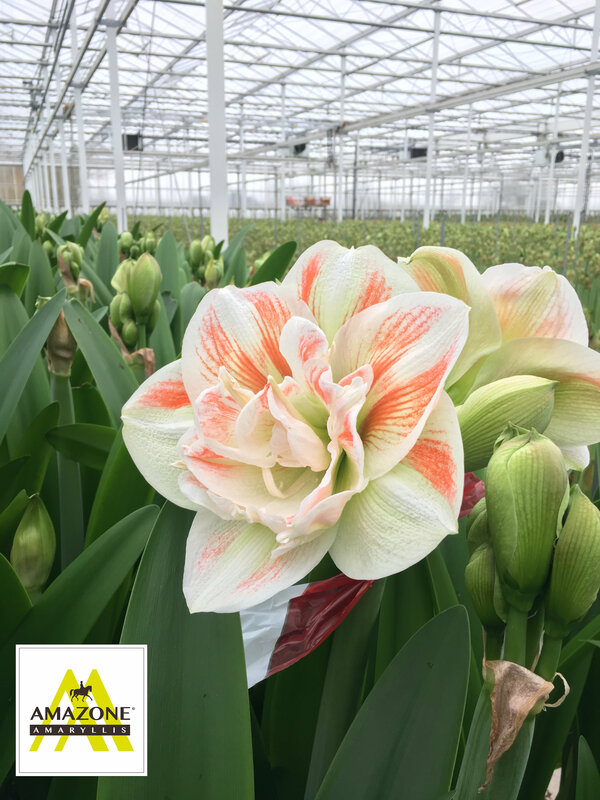 The range of Amazone Amaryllis consists of heavy and exclusive varieties: large red, white, pink and two-colored. Their specialty is growing ten double-flowered (Nymph) varieties. Also new varieties are experimented with. Most important in this process, products have to be uniform and trustworthy. The wide assortment and strict quality provides many opportunities for surprising your customers. 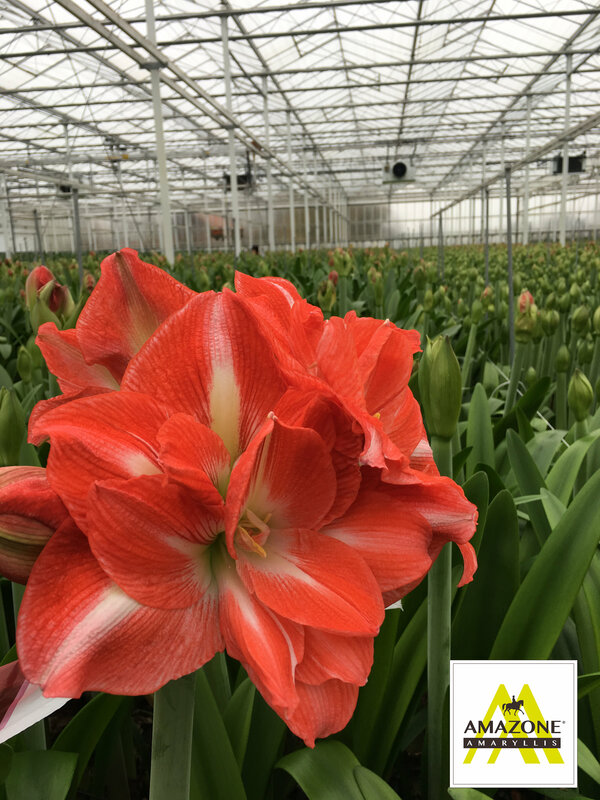 With 15 different varieties, Amazone is one of the most complete amaryllis grower. The image shows all the varieties that are grown during this season. 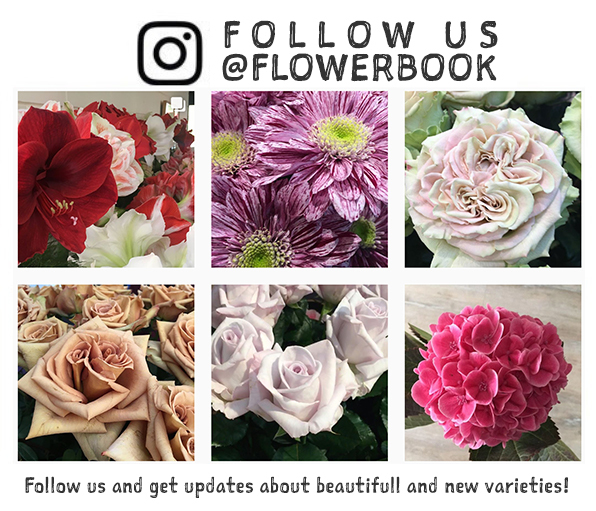 The complete collection and information you can find in the Flowerbook app! Beautiful timelapse of the variety "Popov". It shows you all the stages of this flower. Deleted the app? No worries, it is still available and the best thing is, it is free!